Now it’s in theaters. And the verdict is? Wow, this is a bad movie. I mean, wow. It’s a leaden bore in the hour before the group gets their powers, and then becomes a disjointed mess in the final act, as the post-production re-shoots become increasingly obvious. This is a new industry standard of how to botch a major comic book movie tentpole. Again: wow. Put that on your poster, Fox. More detail and some spoilers below. If you’re going to go with a tween/Young Adult version of the Fantastic Four, you couldn’t do much better than the cast assembled. Miles Teller and Michael B. Jordan have received plaudits in recent years, and perhaps given the right script they could have overcome the doubters who want Reed Richards to have graying temples and Johnny Storm to have blond hair. But that’s not the case in this cobbled mess. Reed develops a teleportation device that can cross dimensions. He gets discovered by Franklin Storm (Reg E. Cathey, a welcome adult in the room) and hired to work in the Baxter Building on a bigger version. He teams up with Sue, Johnny and Victor von Doom, and eventually makes an unscheduled trip to “Planet Zero,” where all hell breaks loose and those that make it back return irrevocably changed. Oh, and Ben Grimm, Reed’s childhood friend, goes along for pretty much no reason. That phrase sums up this whole movie, and its entire plot: pretty much no reason. The greatest sin here is, of course, the handling of Doctor Doom, one of the faces on the Mount Rushmore of comic book villainy. Played by Tony Kebbell as an anti-social genius programmer, this version is at least named von Doom, not Domashev as was originally reported. But that’s the full extent of the “good.” The name “Doctor Doom” is a throwaway line early in the movie, and what the character later becomes bears no resemblance to the character we’ve loved to hate for decades. He looks more like a burn unit C-3PO. He has Carrie-like powers and can explode people’s heads with his mind. He returns out of nowhere with a sudden desire to destroy the world. It’s just a total FUBAR handling. You know what Doctor Doom should be? Remember when Darth Vader first appeared on Cloud City, absorbed a few blasts from Han Solo’s blaster and then invited his quarry to join him for a meal? The odd juxtaposition of this masked guy in a gorilla suit inviting his enemies to dine with him? The “screw you” amount of evil power on display? That’s the closest we’ve ever had to Doctor Doom on film. Give him the full mask. Make him an old friend/rival of Reed’s, with a grudge. Make him a head of state — is that really so hard to believe in a world where the Kims rule North Korea and portray themselves as gods? Can someone please get this guy right? There’s a bare minimum of action in the entire film — a rather shocking paucity, considering this is a summer release. The only set-piece we have is the final fight, which features yet another deadly beam of light shooting into the sky and dreadful CGI. There’s zero build to this ending. Zero. I literally had no idea what was going on, what the objectives were, and how our heroes could defeat a guy who had demonstrated the ability to explode heads, Scanners-style, only moments before. It’s over in a flash, and then the movie itself pretty much ends. You don’t even feel all that robbed, just relieved that it’s finally done and you can go home. Good luck finding a single primary color in the palette here. 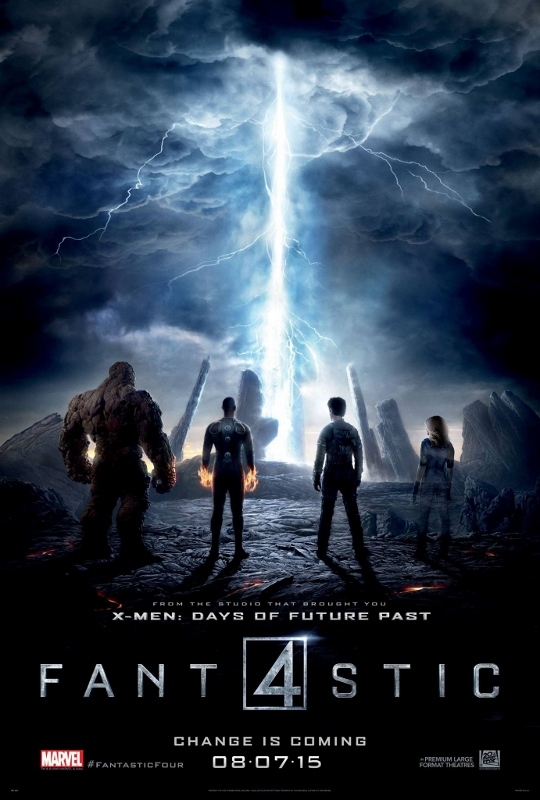 If there was ever a franchise that didn’t need a Dark Knight treatment, it’s the Fantastic Four. There are a few positives to be had. This version of the Thing is the best we’ve ever had in a physical sense, a hulking photoreal CGI monster with actor Jamie Bell’s voice digitally altered. Alas, there’s little of the verve we’ve come to associate with the character, the blue-collar humor that let Mr. Grimm cope with a “gift” that’s a horrifying physical deformity. This “Thing” (none of the characters get hero names) is in need of antidepressants. And when all the characters get their abilities after the mission gone awry, there’s a sort of body horror on display that would make 1980s David Cronenberg proud. Yeah, waking up immolated would freak with your mind. Indeed, Doom’s return and escape from custody is rather scary, and might actually work in a different film. But these few things do not a movie make. I can’t believe I’m typing this, but 2007’s Rise of the Silver Surfer is a better film by far. Yes, it was a mediocre sequel to a mediocre movie, continued with the preposterous chicanery of Jessica Alba as a scientist, and did unspeakable things with Galactus. But by golly, it got the Silver Surfer right. There was at least an effort to make it fun. You could hang your hat on that. You try to hang your hat here, the hook will rip right out of the plaster. We may never know what Trank’s vision was, if any, and how much it was ruined by either his own bad behavior or studio interference — or a toxic combination of both. What’s definitely clear is how bad the end product is. Ill-conceived and poorly executed, Fantastic Four is a true turkey. There’s hardly anything here, folks. Save your money, and hope the FF rights revert back to Marvel sooner rather than later. One-half a rocky Ben Grimm crotch out of five. ← Does the Deadpool trailer portend an absolution of Ryan Reynolds’ Green Lantern sins? I never head to the theater to catch a newly-released film anymore, opting to wait for the blu-ray. But the ripples of discontent I’ve been hearing about this film, combined with the word of mouth that’s now making its way into the media, have guaranteed that’s an order that will never be placed. Perhaps a genuine bomb such as this film seems quickly headed toward becoming will finally prod Fox to cut this property loose. Is it too much to ask that the characters be portrayed as they have been for the the last 50 years? And in the case of the Torch 75 ? The whole cast was wrong. Ben was too puny, Reed too going, Johnny and Sue…whaaa? And Doom doesn’t have super powers he’s evil Iron Man who hates Reed. The FF aren’t superheroes they’re explorers. Oh well. I still have my reprints of Dragon a Man, Blastaar and Medusa to keep me happy.